Polyglot is a highly extensible compiler front end for the Java programming language. It is implemented as a Java class framework using design patterns to promote extensibility. Using Polyglot, language extensions can be implemented without duplicating code from the framework itself. Polyglot has been used to implement domain-specific languages, to explore language design ideas, to simplify Java for pedagogical purposes, and for various code transformations such as optimization and fault injection. Polyglot has been used for both major and minor language extensions; our experience suggests that the cost of implementing an extension scales well with the degree to which it modifies Java. Polyglot compiles and runs on (at least) Linux, Solaris, Windows, and Mac OS X. Ant and the JFlex scanner generator are required to build it. On Windows, you will also need Cygwin. 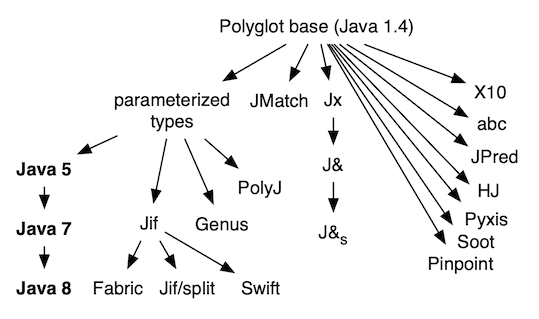 Polyglot supports Java 1.4, Java 5, and Java 7, including features such as generics and annotations. Support for Java 5 and Java 7 is provided as Polyglot extensions, but other Polyglot extensions can build on any version of the language, and can generate any version of Java as output. Polyglot includes PPG, an extensible LALR parser generator based on the CUP LALR parser generator for Java (extended with improved debugging support). The Accrue analysis framework (from Harvard) extends Polyglot with interprocedural, object-sensitive program analysis. Jx/J& – nested inheritance for extensible, composable frameworks. Polyglot now has an Eclipse IDE that can be extended to support Polyglot extensions. Polyglot: An Extensible Compiler Framework for Java. Proc. 12th International Conference on Compiler Construction, Warsaw, Poland, April 2003. LNCS 2622, pp. 138–152. Nathaniel Nystrom, Michael R. Clarkson, Andrew C. Myers. Subscribe to polyglot-users-l@cornell.edu to be notified of new releases of Polyglot, to participate in discussions about Polyglot and to ask and answer questions about Polyglot. The developers do monitor the list: bug reports are welcome; bug fixes are even more welcome. To subscribe, send mail to polyglot-users-l-request@cornell.edu with a subject line of join, or use the form on the right. The current Polyglot developers can be contacted at polyglot-developers-L@cornell.edu. Contributions can also be made via the GitHub repo. Development of Polyglot has been supported by several funding sources, including DARPA Contract F30602-99-1-0533, monitored by USAF Rome Laboratory, ONR Grant N00014-01-1-0968, NSF Grants CNS-0208642, CNS-0430161, and CCF-0133302, an Alfred P. Sloan Research Fellowship, and an Intel Research Ph.D. Fellowship.